ITHACA, NY–The bacterium that causes citrus greening disease is not only decimating citrus orchards, but wreaks havoc in the guts of the insect that transmits it. Cells in the midgut of the Asian citrus psyllid self-destruct when infected with the citrus greening bacterium, report researchers in the laboratory of Michelle Cilia, a Research Molecular Biologist at the USDA Agricultural Research Service and an assistant professor at the Boyce Thompson Institute (BTI) and the School of Integrative Plant Science at Cornell University. The findings, published Sept. 15 in Scientific Reports, suggest that strategies to interfere with cell death in the midgut may prevent the psyllid from spreading the bacterium further. Citrus greening disease, also called Huanglongbing, has taken a terrible toll on Florida’s $9 billion citrus industry and infected trees have already been detected in California. The disease is caused by the bacterium Candidatus Liberibacter asiaticus (CLas), which is transmitted by the Asian citrus psyllid as it moves from tree to tree, feeding on sap. The new research shows that the Asian citrus psyllid tries unsuccessfully to fight off the infection by killing infected cells lining the gut but the observation can also be explained by CLas’s effort to spread beyond this important tissue barrier. The midgut is the first barrier that CLas must pass before entering the insect’s body fluid, called hemolymph. CLas then travels to the salivary glands, which it must cross before being injected into a new tree through the insect’s piercing, sucking mouthparts. 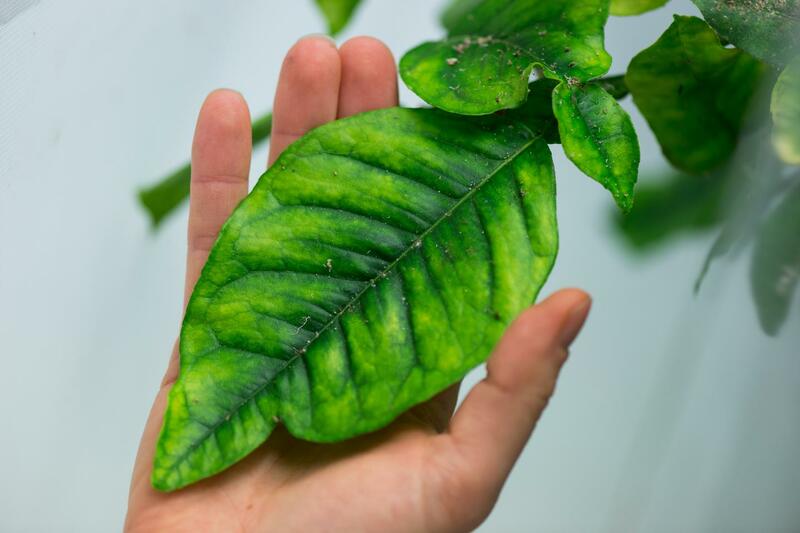 Researchers at BTI, the USDA and a visiting scientist from the Volcani Center raised Asian citrus psyllids on CLas-infected citrus plants and then dissected out their guts and visualized them under a microscope. When compared to non-infected psyllids, the gut cells exposed to CLas had dead spots, abnormalities and broken nuclei. These changes were accompanied by biomarkers signifying programmed cell death and DNA degradation. All of these signs point to an immune response mounted by the psyllid against the bacterium. The Asian citrus psyllid is most effective at transmitting CLas when infected as a nymph, and insects that are infected as adults are less successful vectors for the bacterium. The authors speculate that adult psyllids may be better able to fight the CLas infection and reduce transmission rates. The study adds to the growing body of work suggesting that bacteria and viruses can escape cell death in the insect, and in some cases, may even use it to their advantage to increase transmission. In practical terms, the findings point to cell death in the psyllid midgut as a place where humans could intervene to block the bacterium’s path through the insect. Scientists could introduce “interdiction” molecules that block proteins involved in cell death, or use genetic approaches to silence genes related to the process. Gut binding compounds have already been developed that stop aphids from taking up plant pathogens, and the researchers are working on similar compounds for psyllids. Deploying one of these strategies would likely take a year of laboratory experiments, followed by two to five years of field testing and another year for EPA and USDA approvals. While the delay will be painful for citrus growers, a targeted and precise approach is likely to be more successful at saving the citrus industry than current attempts to treat groves with pesticides or antibiotics. Co-authors in the study include Murad Ghanim of the Volcani Center in Israel, BTI visiting scholar Somayeh Fattah-Hosseini and former BTI postdoctoral scientist Amit Levi. Research reported in this news release was supported by grants from the California Citrus Research Board (5300-155 and 5300-163), the United States Department of Agriculture Agricultural Research Service (8062-22410-006-00) and the Agricultural Research Organization in Israel.